I'll admit I was a little tentative when I first took this guitar out of it's gig bag. Tiny sound hole, small body, mahogany back and sides: I was sure this guitar would be a thin sounding guitar with a mid range that was going to be too honky for my taste. I couldn't have been more wrong. The low end on this small guitar is HUGE and very well defined. Rich and boomy, without any of the mud you can sometimes get out of an unbalanced instrument. Open chords are full and the trebles have just the right amount of brightness. Even complex chords with tons of chord tones sounded clear and defined. This guitar is a fantastic and inspiring tool that is perfect for all types of fingerstyle and singer/songwriter applications. It has had the bridge reworked by our luthier. The intonation is now spot on and the strings are transferring their energy to the top wonderfully! Give it a try and listen in amazement! 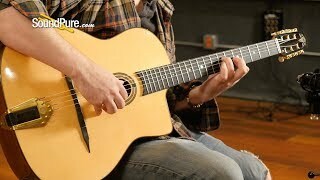 In this video, Sound Pure Guitar specialist Zak Jenkins tested a surprisingly rich Altamira M10 Gypsy Jazz Guitar (Used). Altamira Guitars are named after the Cave of Altamira in Spain, famous for its upper Paleolithic cave paintings featuring drawings and polychrome rock paintings of human hands and wild mammals (the inspiration for the Altamira logo). It was the first cave in which prehistoric cave paintings were discovered and has been declared a World Heritage Site by UNESCO. With its name based on a traditional Spanish landmark, and with the classical guitars' deep Spanish roots, Altamira guitar luthiers strive to follow in the footsteps of the great Spanish luthiers, obeying traditional Spanish construction methods to produce consistently high-quality instruments at great value. Observe the high level of craftsmanship and finesse involved in the making of an Altamira guitar. All instruments are hand crafted based on traditional Spanish construction methods from premium rosewood, spruce, and cedar woods, and are all solid top guitars. Solid top guitars use one solid piece of wood for the top (soundboard) of the guitar. Laminate top guitars (which are significantly cheaper) use a mixture of woods combined as a mesh. The top of the guitar is the vital component for generating sound, vibrating as a string is plucked. With solid top guitars, the more this soundboard vibrates, the more this single piece of wood adapts and 'opens up' which improves the quality of sound as the guitar ages over time. This is not the case for laminate guitars which have more rigid tops and thus do not experience this improvement in sound quality. All Altamira guitars (ranging from the entry level 'Basico' up to the professional series concert guitars) are solid top guitars.